The request for qualifications and proposals included a 144-page document complete with a design of the flyover from 2007 in the materials distributed to the bidders. Designworkshop, the firm Beshara recommended as most qualified bidder, made no specific reference to the Daniells Bridge Road flyover in its proposal, but bidders Moreland Altobelli Associates Inc. and Pond & Company did. The Board of Commissioners postponed a decision on the study after Commissioner Jim Luke said the Board to be seated after the first of the year, rather than the current one, should consider the $60,000 study. The final member of that new Commission will be decided in a runoff election on Dec. 6, with early voting starting at the Board of Elections and Registration Office opposite the Courthouse tomorrow (Monday) morning. Candidate Chuck Horton has said he is opposed to the extension of Daniells Bridge Road to fly over SR Loop 10, while Candidate Marcus Wiedower has said he is in favor of the flyover, though he has expressed concern about how that project would affect residential neighborhoods. Moderator Charles Bullock asked both Horton and Wiedower for their positions on the flyover during a candidate forum sponsored by the two Oconee County Rotary Clubs on Oct. 13. I also asked about the issue during interviews I did with Horton and Wiedower prior to the Nov. 8 election. Wiedower said he sees the flyover as a way of relieving traffic in the commercial areas along Epps Bridge Parkway, but he wants to find a design for the roadway that would minimize impact on the subdivisions along Daniells Bridge Road. Horton said the flyover isn’t needed. 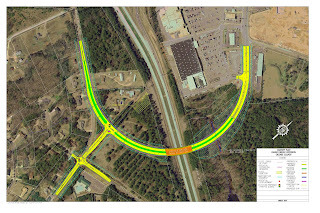 The flyover would carry traffic from the stub of the Oconee Connector at Home Depot to Daniells Bridge Road near Chestnut Hill Road. The documents provided with the request for qualifications and proposals for the SR 316/Epps Bridge Parkway Corridor Study included a 144-page report by Jordan Jones and Goulding, then of Athens, of the proposed flyover. Included in that document is a map showing the new roadway coming close to Chestnut Hill Road before turning to intersect with the existing Daniells Bridge Road. Many, but not all, residents of subdivisions along Daniells Bridge Road have expressed opposition to the proposed project in the past, including many residents of the subdivision in which I live, Welbrook Farms. Designworkshop of Ashville, N.C., was the low bidder on the project at $60,000. Beshara did not indicate how the county would pay for the study. The cost is close to the total amount the county has budgeted over two years for a revision of its Comprehensive Plan, which provides an overview of all land use in the county. Work on that plan will begin after the first of the year, B.R. White, director of the county’s Planning Department, told me in an email message on Nov. 2. Total cost is $65,000, White said, but Northeast Georgia Regional Commission will provide consulting services not included in that figure. County Administrative Officer Jeff Benko told me in an email message on Nov. 2 that the county is paying $30,282 in annual dues to NEGRC at present. Pond & Company of Peachtree Corners actually recommended that the flyover be a part of the county’s future plan, saying that it “could provide beneficial connectivity” with existing roadways. Commissioner Luke argued at the Nov. 1 meeting that any decision on the corridor study should be made by the new group of commissioners. The other commissioners agreed. Luke is retiring at the end of December and will be replaced by Mark Thomas. Mark Saxon and William “Bubber” Wilkes will continue on the Commission. John Daniell replaces retiring Melvin Davis as Commission Chair. Either Horton or Wiedower will fill the unexpired term as Post II Commissioner, left vacant when Daniell resigned to run for the Commission Chair position. This flyover bridge is a $20 million dollar boondoogle, being pushed through so Melvin can placate Frank Bishop, Jamie Boswell, and a few good ole boy landowners looking out for themselves. So much for conservative Republican fiscal responsibility. It will make Daniells Bridge Road and Government Station unbearable cut-through's. It benefits the chosen few, and will do little to alleviate traffic. Very, very surprised that Emil Beshara, normally a straight shooter, is pushing this through in a less than transparent manner. Wiedower for it, Horton against. Marcus ready to continue the Melvin Davis playbook. Jim Luke is right: This shouldn't even be mentioned until the new commission takes office. John Daniell has been remarkably quiet...waiting to hear his take on Calls Creek, sewer treatment plants, the flyover bridge, multiple planned fast food restaurants, etc., etc. Completely agree with you, Anonymous. Emil Beshara is constantly threatened with his job by Melvin. I personally am not surprised he is not saying much about he "back story" on this. The cross road at Home Depot, Lowe's and Epps Bridge Parkway is already jammed. Extending the stub off HD doesn't solve the problem. It only shovels the traffic jam from outbound off Oconee connector to the HD plaza. It doesn't help the outbound traffic from Epps Bridge due to the bottleneck is out of this section. The only seeing benefit is to benefit commuting between Oconee and HD. That doesn't worth $20 million dollar plus the damage to the residential area.